When setting a background image on a page element with CSS, you can control its position with "background-position", but an often-forgotten trick is that you can control its position behavior with "background-attachment". What you can't see in that image, is that when you move the browser window wider and narrower, that white main content area stays centered while the colored pencils stay fixed. But anywhere the white main content area covers the pencils, they appear faded and blurry, like looking through frosted glass. Sometimes the simplest tricks have the the neatest results! I was first shown this trick by Roy who pointed me to this website. Wow, what an awesome technique! I love the fact that it’s so simple and yet produces such a “complex” and interesting effect. Granted it’s simple, but I’d never think of it by myself, not in a million years! wo hoo .. that was really awesome ..
and i am luck to find here first ! I love simple techniques like this used to great effect. Thanks for posting this, Chris! Just a thought, but could you also make your bg-blurry.jpg a semi-transparent white gif? That way it would work on any image. Semi-transparent white overlays produce a slightly different effect. Try it out for yourself and see! 1) It would have to be an alpha-transparent PNG. GIF’s don’t do alpha-transparency. 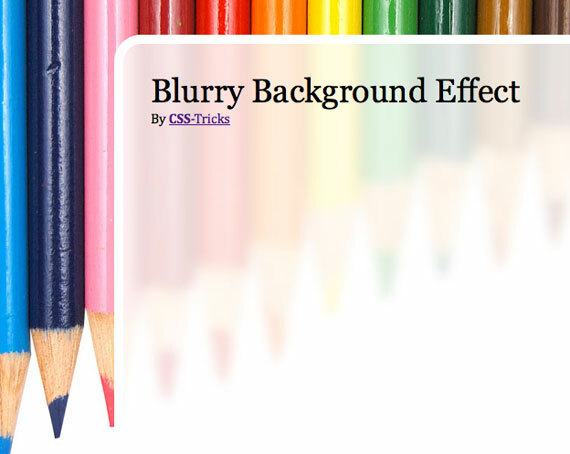 2) It wouldn’t really “blur”, it would just “fade”. The Compex Spiral is the first example I ever saw of something like this. It’s a pretty slick way of making such a cool effect. thanks for the article, its a nifty, awesome CSS effect ::) Much appreciated. Is it me or does this technique break when you have to scroll down? Too bad, cuz it’s pretty sweet. Ah yes, good catch, I didn’t have enough content in there for scrolling. What you could do is just add the fixed position to the body background as well, which will keep them together. Right, the author has done the same thing on his website, both body and page-wrap have fixed backgrounds. This is great. Thanks again Chris for your wonderful tips! Thanks for the article, interesting stuff. Cheers! Looks like a riff on Complex Spiral Distorted (published 23 Feb 2002), which fixes both backgrounds in order to handle content scrolling. I wonder if that’s where the Bomb Squad folks got the idea. Very likely, I’m sure. Definitely not a new idea, you were obviously rocking it before I even knew what “CSS” stood for =). I love this effect. There’s a lot of potential here for easter eggs and hidden surprises on your site. Must experiment some more. How will this effect IE6? IE6 normally isn’t to happy about fixed elements, although its not something I do have alot of experience with, fixed position that is. I just popped open IE 7 and it worked fine (except for the rounded corners, since Chris is using the moz-border-radius and webkit-border-radius attributes. Thanks for the tip, Chris! A great effect, but I wish I could figure out how to achieve this with code (not the CSS directional blur) so separate images wouldn’t be required. It doesn’t “blur” the background, but it will make it transparent. It works in most major browsers, too. It’s not quite the same effect, but it allows for a non-image design. You can see a live example here: 175amonthman.com. Good tip; thanks! Thanks. This is very usefull tricks. This example is stupid because it doesn’t work on ie6 and POPOEVER is right because it doesn’t work when you try to scroll down with Opera or Firefox. Dude! This site is called “CSS-TRICKS”… Chris here is showing us an interesting trick that we never knew about. now if you’re still using a browser thats Ie.6? . I suggest you upgrade. And anyways we all here at css tricks have completely freed ourselves from IE’s crappy browser. And if you think this neat trick is stupid? I suggest you make one yourself and show it to us. When IE6 is still the most used browser I can’t see how this effect is useful to anyone unless they want to exclude IE6 users. This does NOT work in IE6. Wow, looks really cool, how did you do that, i mean the drag and drop? On mouseup you have to unregister your moving function and done. I follow your website by feed . It’s a nice effect but like Eric and xbakesx said it has been done before, a long time ago. I was intrigued by that Complex Spiral example, when I saw it back when I was pretty new to CSS. However your demo page doesn’t work on Google Chrome. The other link works great in Chrome. The background attachment fixed in the body tag should fix it. This looks great, the IE fix is just an htc that tells it how to handle png files. I will try it out and see how it works with my site as well. Dude… you get absolutely no love for that. What a lousy trick! Multiple backgorund images, plus, try making that demo page really short and scrolling. Full of holes. thanks for reading the other comments and replies before posting! Thanks for sharing the whole thingy. The jQuery code could look like this. tested in IE 8,9, latest chrome and Firefox. 'background-position': "0px -" + diff + "px"
This demo was pointed out to me on the Public-fx mailing list. The desire is to create a similar effect but with only one image. This is the list message ( from last year) and it’s being discussed now in recent times in this thread and this thread. Here is my attempt with only one image using ‘element()’ and CSS filters. Could be much better. So simple! I had a slight issue at first as I didn’t see “background-size:cover;” being applied to one of my images. After I applied it to the new blurry image it worked. Great trick!